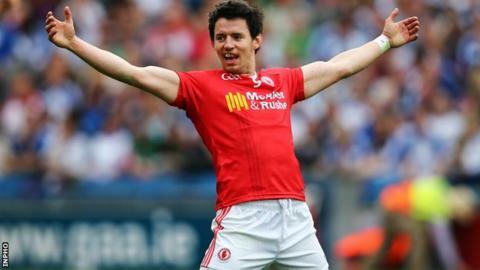 Tyrone footballer Mattie Donnelly has won a first All-Star after starring in the Red Hands' run to the All-Ireland SFC semi-finals. Conor McManus' prolific form for Ulster champions Monaghan earned him a second All-Star to add to his first in 2013. Seven of Dublin's All-Ireland winning side make the GAA/GPA Football Team of the Year with beaten finalists Kerry providing four of the team. Semi-finalists Mayo picked up two awards at Friday's ceremony in Dublin. McManus bagged 1-26, averaging over seven points a game, as Monaghan captured a second Ulster SFC title in three years this summer. Donnelly, one of Tyrone's most versatile players, was hugely influential in the team's qualifier wins and All-Ireland quarter-final victory over Monaghan in Croke Park, before a narrow defeat by Kerry in the last four. He also captained his club Trillick to a first county SFC title since 1986 last month and leads the side into an Ulster club semi-final against Scotstown (Monaghan) on 15 November. All-Ireland champions Dublin have had their year recognised with All Star awards for Rory O'Carroll, Philly McMahon, Cian O'Sullivan, Jack McCaffrey, Brian Fenton, Ciarán Kilkenny and Bernard Brogan. Runners-up Kerry, who defeated Tyrone in the semi-finals, are represented by Brendan Kealy, Shane Enright, Anthony Maher and Donnchadh Walsh. Lee Keegan and Aidan O'Shea got the nod for Mayo. Dublin's raiding wing-back Jack McCaffrey received the Footballer of the accolade with Mayo's Diarmuid O'Sullivan named Young Footballer of the Year. Kilkenny's TJ Reid won the 2015 Hurler of the Year award with Waterford's Tadhg de Burca named as Young Hurler of the Year. 2015 GAA GPA Football All-Stars: 1 Brendan Kealy (Kerry); 2 Shane Enright (Kerry), 3 Rory O'Carroll (Dublin), 4 Philly McMahon (Dublin); 5 Lee Keegan (Mayo), 6 Cian O'Sullivan (Dublin), 7 Jack McCaffrey (Dublin); 8 Brian Fenton (Dublin), 9 Anthony Maher (Kerry); 10 Mattie Donnelly (Tyrone), 11 Ciarán Kilkenny (Dublin), 12 Donnchadh Walsh (Kerry); 13 Conor McManus (Monaghan), 14 Aidan O'Shea (Mayo), 15 Bernard Brogan (Dublin).